Cultural Cool is Always in Style. Living fearlessly Fourteen years after being diagnosed with a rare and incurable stage IV cancer, Kris Carr is not only living a healthy, full life, but has revolutionised the world of plant-based diets. Good and simple Nature & Health talk to Hemsley + Hemsley, the healthy food darlings of social media, Foxtel, and Vogue, about their meteoric rise and how it’s transformed their lives. Ease insomnia The bedroom is dark and quiet, you’ve had your chamomile tea – but you’re still wide awake. Naturopath Teresa Mitchell-Paterson suggests five little all-natural helpers. Love the skin you’re in Your skin is like a public broadcast service that provides you, and everyone who sees you, with a window to your inner health. 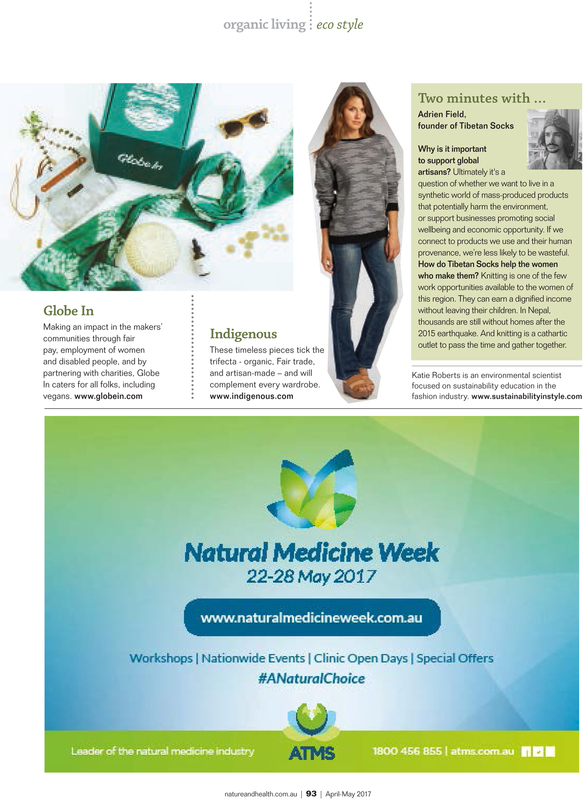 Naturopath Tania Flack reports. Now ear this! Think you’ve heard it all when it comes to acupuncture? Think again: auriculotherapy is a distinct branch of the ancient modality with unique benefits. Make a wish! When you align with the New Moon to make your wishes, you’re activating what Deepak Chopra calls The Law of Intention and Desire, which states that “the future is created in the present”. Got your number! Can your date of birth and name impact your life’s purpose? According to numerologist Michelle Buchanan, they certainly can. Vital signs It’s your body so you have a right to learn about your health. Some issues can fly under the radar, so we list the top five questions every woman should ask. Embracing silence In our increasingly noisy world, where quiet is rare, the ancient Indian technique of Vipassana provides much-needed respite (I would personally love to try this… I’m yet to have the spare time to brave it but it’s on the list!). 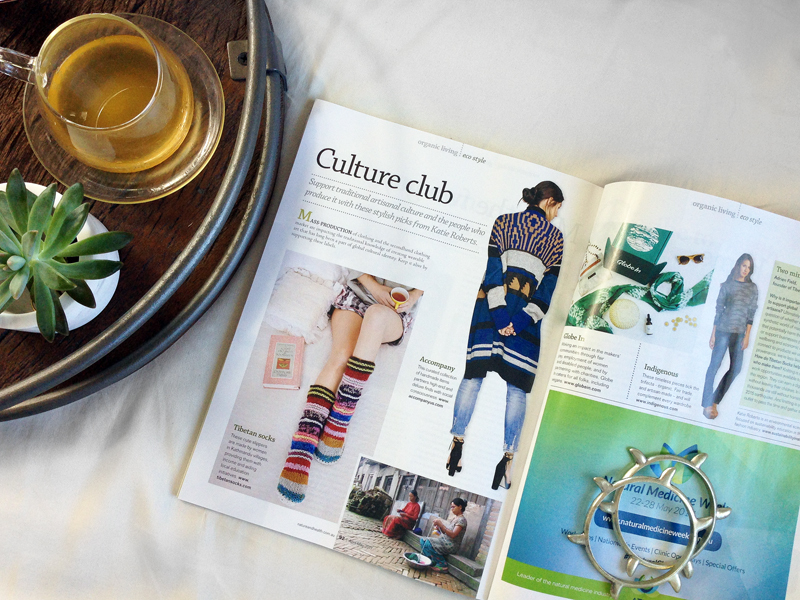 As the mag’s Eco Style columnist I have the pleasure of deciding what awesome eco and ethical fashion finds it’s way to the pages each issue. This issues focus is fashion that supports culture. In the fast-fashion world that we inhabit many of the smaller, traditional crafts are being sidelined due to the accessibility of cheap fashion. Be it the introduction of western manufacturing to an area or the influx of secondhand clothing that comes in from the global secondhand supply chain, our fashion passion can affect the continuation of cultural knowledge. 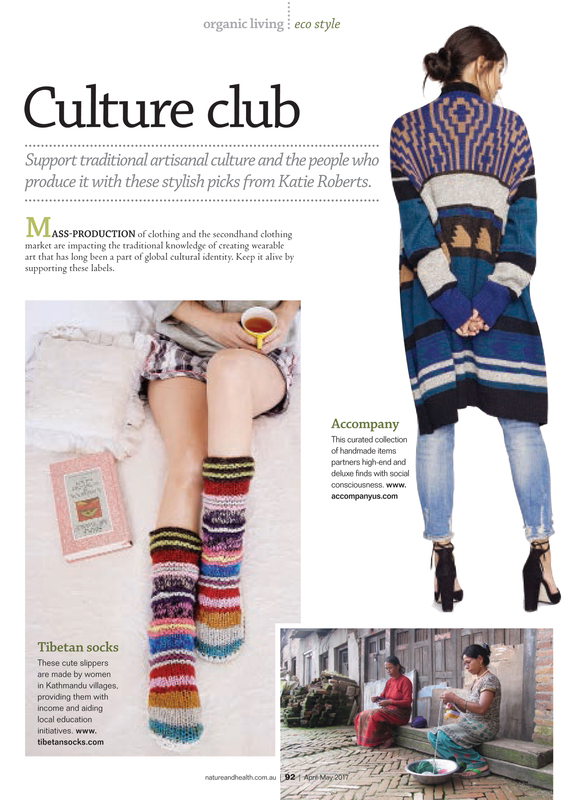 The great news is that there are labels out there fostering an east-meets-west culture club where traditional handicrafts and sewing skills are providing things of beauty to the ‘fast fashion’ target audience. You can check out some of these beautiful things below (sorry for the slightly blurry copy! Something weird happened to the PDF). 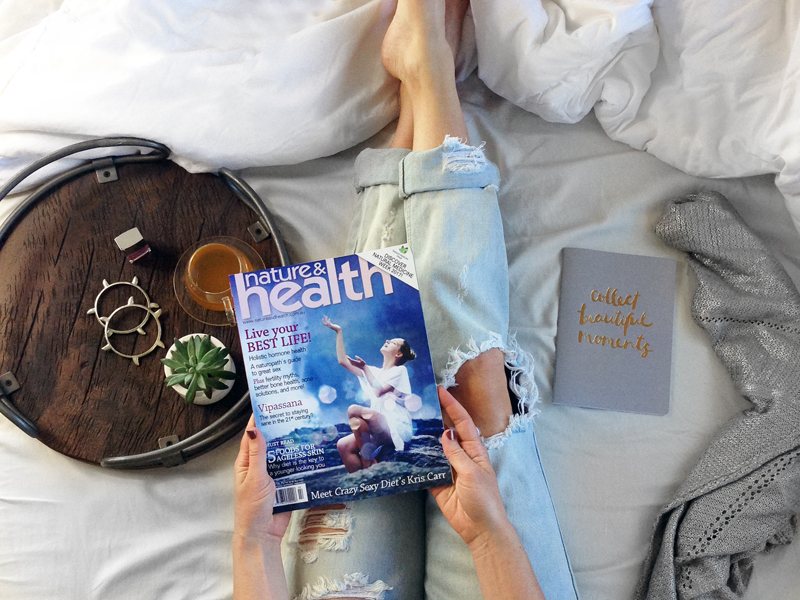 Do you read Nature & Health? Perhaps you have a fave label that uses cultural or indigenous knowledge to create their products? Any reflections? Please share.